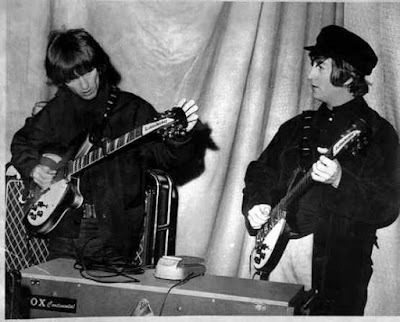 So far, no photos of the Beatles performing in Liverpool in 1965 have surfaced. The closest thing we have this this photo of George and John tuning up guitars before the show. The Liverpool evening show, the last one ever in Liverpool, must have been quite a concert. During the Koobas set, Paul McCartney came out and played drums on their version of "Long Tall Sally." Can you even imagine that? Sitting there, trying to enjoy the opening acts, but finding it hard because you want to see the Beatles and then suddenly there is Paul behind the drums with a different band? The crowd must have gone wild! It is said that they allowed the fans to dance in the aisles during the show. It is my hope that one day photos, video and/or audio from this concert will surface. If nothing else, I hope a fan that was there will come forward and share her memories of that night with us.